The small village of Horley lies about 3 miles north of Banbury on a west facing slope topped by its medieval ironstone church. During day time hours you will find the church open. 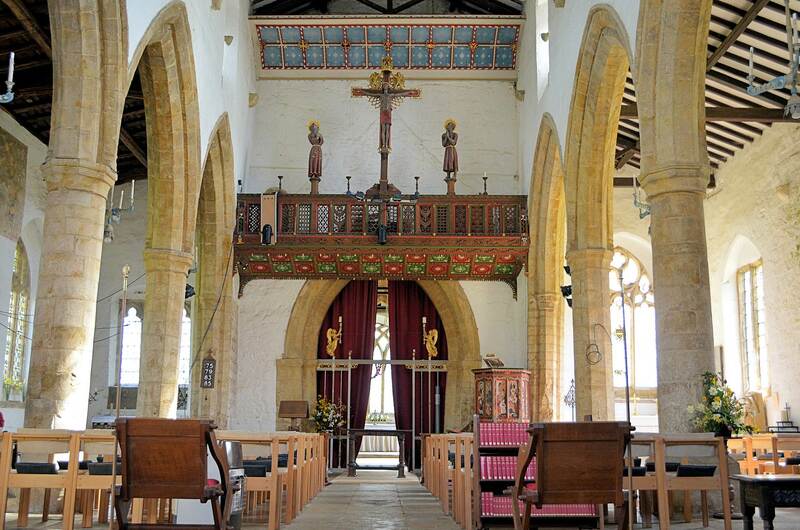 Entering through the west door, you immediately face the rood loft in front of the chancel arch. The dark skinned Christ with his straight arms stretched wide has overcome agony and death and is crowned by two angels. 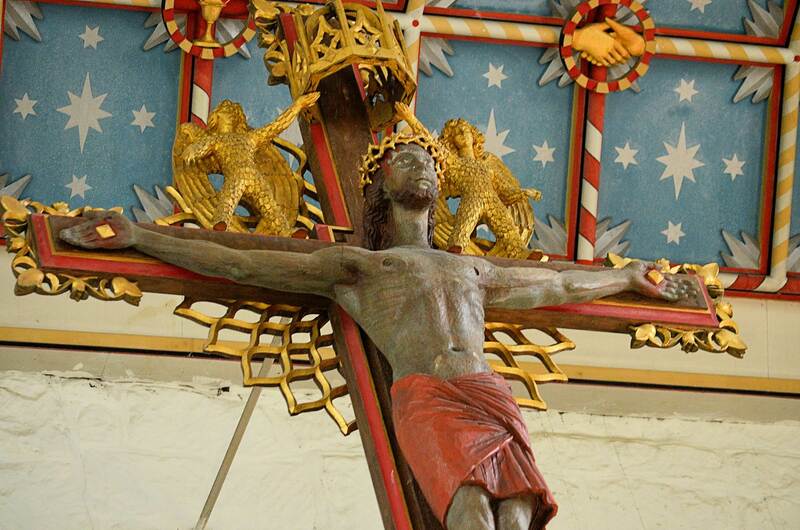 Behind the cross a circular golden lattice work radiates, as do the golden nails piercing the hands and feet. The red colours of Christ’s loin cloth and of Mary’s and John’s robes blend in with the colours of an ancient wall painting of St Christopher. Walking closer you see the carved chancel screen, painted blue and gold, with two delicately sculptured golden angels holding candles. The light blue of the chancel screen is echoed in the blue and silver colouring of the six carved candelabras hung at regular intervals from the ceiling of the nave. You might wonder when this group of obviously related carvings, with their rich warm colours harmonizing with the medieval interior and its ancient murals, was made. 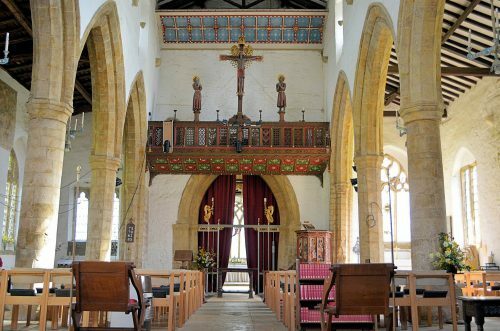 Their spare style seems neither medieval, nor Victorian restoration. 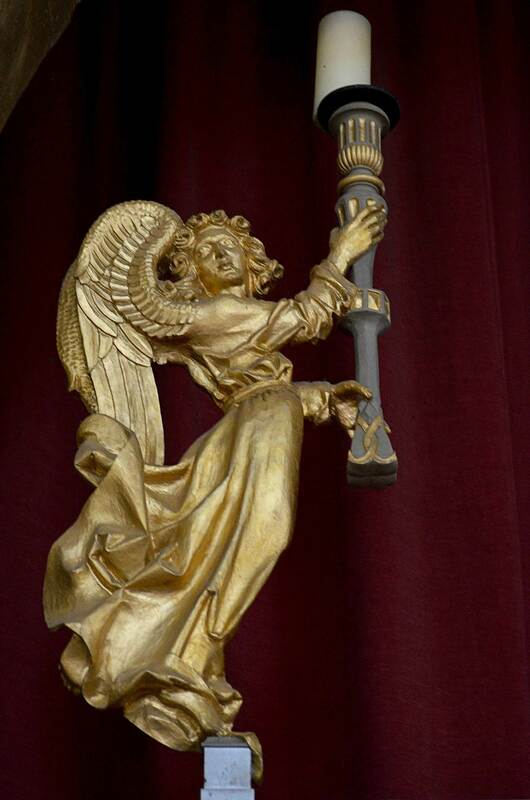 From the detailed church guide, which you can purchase for £2, you learn that this programme of work was carried out from 1947 – 50 under the direction of the Oxford architect Laurence Dale, who commissioned “the Bauhaus-trained John Allenby (1899 -1950)” to do the carvings. 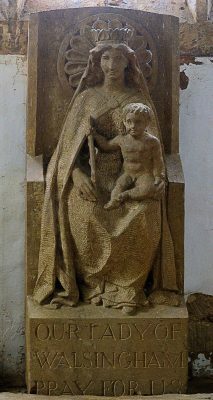 Also, the small Walsingham Madonna sculptured from ironstone is by Allenby. So, who was John Allenby? You may already have tripped over the term “Bauhaus-trained”. John Ivor Allenby was not his original name. He was Johannes Ilmari Auerbach, a German Jewish refugee. He had been imprisoned and maltreated by the Nazis for his Communist leanings. His wife Inge was also Jewish. She had a British passport. So in 1936, on the advice of her father they left Germany. Via Cyprus they finally arrived in London in 1938. During the war Auerbach worked for the War Office, until he was demobilized. In 1946 he followed his wife who had already settled in Oxford. He taught sculpture at the Oxford School of Art. They lived very frugally in one furnished room in Keble Road where they had to wash their faces, potatoes, stockings, fish, feet, hankies, vegetables, plates under the same tap and where the comb lay next to the butter and the tooth brush next to the shoe brush as he wrote to his sister in Germany. (His letters have been published in German.) In 1949 was it possible to rent a studio. Until then he had only the use of the studio at the art school. The material circumstances may not have been favourable, however, after long wanderings his inner life had matured and he felt ready to create his life’s work, as we read in his letters. But the sculptures for the church in Horley were his last major works. They were a commission after his own heart, as he remarked to the journalist of the “Oxford Mail” writing about this new installation. Early in 1950 he died from a heart attack, aged 50. Neither the church guide, nor newspaper articles dealing with the new installations at St Etheldreda mention John Allenby’s German Jewish background. His adopted English name seems to hide it. The late forties, as the fifties, were the time of the great silence about the past for victims and perpetrators alike. What had happened seemed to transcend the capabilities to fathom it. My wish is that more people see these art works in the knowledge that they were created by a Jewish refugee from Nazi Germany who had the good fortune to escape the holocaust and find a new home in this country. This awareness may add another dimension to the experience.